There are more and more people care about the details of their skin, iris or hair conditions. This device is suitable for saloon or home use as it is small, suitcase style, which can be very easy to carry around. With two different cameras, you can see your skin or hair in a better way. 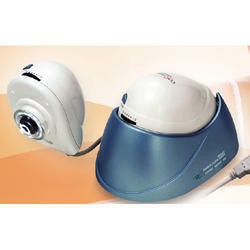 Coscam provides cameras that help in analysis of skin, scalp and hair conditions. As an affluent name of this domain, we hold expertise in presenting high quality Skin and Hair Analyzers. This machine uses the most advanced photography technology, multi-media photo compress technology and optics micro- magnifying- technology. It displays the magnified pictures of hair and skin. This machine is easy to operate, convenient to use, easy to carry. It is mainly used for hair and skin analysis on TV monitor. We bring forth vast industrial experience and expertise in this business, instrumental in offering Skin And Hair Analyzer.